1557 ND JORDAN (1964) Kennedy*. Set of six imperforates in original colors. Scott Nos 457-62, Yvert Nos 426-31. 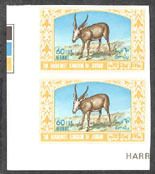 3100 ND JORDAN (1967) Persian gazelle*. Imperforate vertical corner pair of proofs. Scott No C48, Yvert No PA51c. Beautiful! 3184 ND JORDAN (1967b) Angora goat*. Imperforate vertical corner pair of proofs. Scott No 543, Yvert No 570c. Scarce!